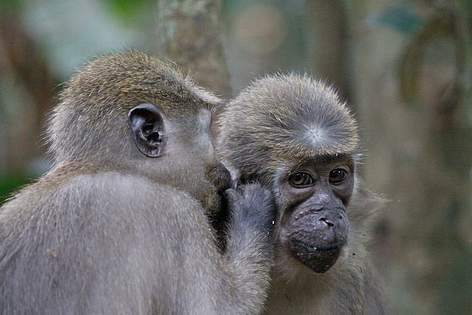 Two young male, agile mangabeys (Cercocebus agilis) groom each other in Dzanga Sangha National Park. A world´s attraction, they belong to the only group of agile mangabeys habituated to the proximity of humans. From famous forest elephants to the obscure Charaxes butterflies, the Congo River Basin has earned a global reputation for the variety of wildlife found inside its forests. Some of the world’s most spectacular and endangered wildlife lives in Central Africa, including one-half of the remaining elephants on the continent. Ten thousand species of plants (of which 3,000 are found nowhere else), 1,000 species of birds, and 400 species of mammals2 , 216 species of amphibians, 280 species of reptiles and more than 900 species of butterflies are found here. But while these forests are rich in the numbers of species by world standards, they actually have smaller numbers than other tropical rainforests throughout the planet. The rivers of the Congo River Basin are especially rich in aquatic biodiversity, with most species unique to the region (endemic). Endemic species vary considerably in range and size. The pygmy chimpanzee, or bonobo (Pan Paniscus), is distributed throughout the forests of the Congo River Basin and the okapi (okapia johnstoni) is found across north and northeastern DRC. Rivers such as the Congo and the Ouabangui have played critical roles in limiting the range of several species, especially mammals. Time has also contributed to this phenomenon. Over millions of years, dry and wet periods have alternated in the Congo River Basin, leading to the containment of several species in very specific habitats with distinct climates. 1 FORAFRI. Faune. Accessed 7/10/05. 2 USAID. Congo River Basin Forest Partnership. Accessed 08/11/05. 3 FORAFRI. Faune. Accessed 7/10/05. 4 Sayer J A., Harcourt CS, and Collins M (editors). 1992. The conservation atlas of tropical forests: Africa. IUCN (World Conservation Union). Simon & Schuster: New York. 5 FORAFRI. Faune. Accessed 7/10/05. 6 FORAFRI. Faune. Accessed 7/10/05.